MILWAUKEE -- The Brewers and reliever Francisco Rodriguez agreed to a one-year, $8 million contract just ahead of Tuesday's deadline for arbitration-eligible players and their teams to exchange figures. The team also struck a $2.175 million deal with reliever Kameron Loe, leaving only two arbitration-eligible players unsigned: starter Shaun Marcum and reliever Jose Veras. Rodriguez was the team's trickiest case because he was a free agent who accepted arbitration, not a player with the usual three to six years of Major League service, and because he is a career closer who is serving as a setup man with the Brewers. Those factors could have made for an interesting debate between the Brewers and agent Scott Boras about Rodriguez's value in the current market. Per club policy, the Brewers did not announce any salary information for either player, but an industry source confirmed both salaries. Both deals include performance bonuses, including up to $625,000 for Rodriguez, according to a second source. Rodriguez would get $125,000 each for 15, 20 and 25 games finished, plus another $250,000 for 30 games finished. His base salary is much lower than some analysts expected, considering Rodriguez earned $11.5 million in a 2011 season split between the Mets and Brewers. Rodriguez is fourth among active pitchers and 24th all-time with 291 saves, but he accepted arbitration knowing that John Axford was in place as the closer. That decision surprised the Brewers, who had extended the offer expecting Rodriguez to decline and sign with a team with a ninth-inning need, positioning Milwaukee to receive two compensatory pick in the 2012 First-Year Player Draft. Instead, barring a trade, Rodriguez will return to pitch the eighth inning in front of Axford, who is still one season shy of qualifying for arbitration. Assuming Rodriguez remains, the Brewers will be guaranteeing $8.5 million-$9 million to their eighth- and ninth-inning men, a relatively manageable amount considering the payroll is projected for the $90 million-$100 million range. Rodriguez was not thrilled to cede the ninth inning, but he pitched brilliantly for the Brewers during the second half of the season and into the postseason. 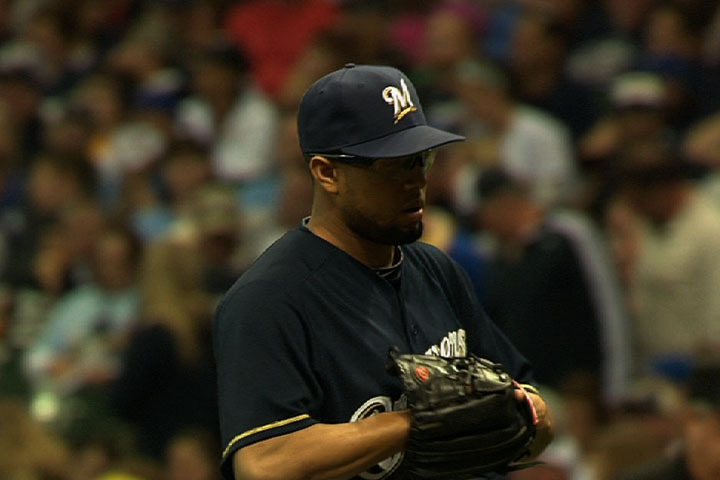 He allowed only six earned runs in 29 regular-season appearances for a 1.86 ERA in a Milwaukee uniform. The sides settled just before Tuesday's noon CT deadline for teams and players to exchange salary proposals. With deals done for Rodriguez and Loe, only Marcum and Veras remained unsigned. According to The Associated Press, Marcum requested $8.7 million in arbitration and the Brewers offered $6.75 million. Marcum earned $4.05 million last season and was Milwaukee's most reliable starting pitcher before a late-season swoon. The right-hander is entering his final season before free agency, but the sides have discussed only a one-year agreement. Veras, acquired in December from the Pirates for third baseman Casey McGehee, filed for $2.375 million and the Brewers offered $2 million, according to the AP. McGehee, incidentally, filed for $2.725 million and the Pirates offered $2.35 million. All times are GMT +2. The time now is 12:14:24.